The first quarter was minted in 1796. It featured a “Draped Bust” Miss Liberty facing right on the dated side and a small Eagle on the reverse. These were made only for one year and only about 6,000 pieces were made. It wasn’t until 1804 that quarter dollars were minted again and this time the design featured a large eagle on the reverse. The “Draped Bust” design was made until 1807 when the mint again stopped minting quarters. In 1815 quarters were again minted and this time the portrait of Liberty faces left and is wearing a Liberty Cap. For the first time the Latin Legend “E Pluribus Unum” is incorporated in the design and appears above the Eagle on the reverse. 1828 is a significant year. In that year the quarter was reduced to the same size as today’s quarter. These early quarters are valuable in any condition. The 1796 one year type is worth $5,000 even in very worn condition. The Draped Bust and Capped Bust types are worth $60 to $150 in average circulated grades. 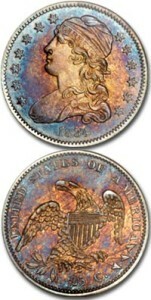 From 1838 to 1891 there was a long run of quarters with the Seated Liberty design. These can be worth from $15 to $35 in average condition. Note that any of these quarters are worth significantly more if they are in uncirculated condition.